World War I was one of the most significant events in the history of the Newells of the Dock. By the start of WWI the Dock, which was never more than a small village, was in decline. Many Newells, like my grandfather Albert, had moved away to work in the coal mines of Cape Breton, the iron mines at Bell Island, Ontario or New England. In 1911, three years before the start of the War, the population of the Dock was only 167. 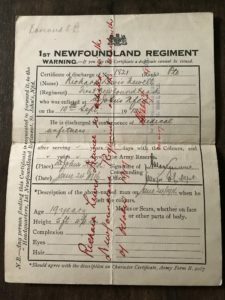 At least five Newells from ‘The Dock’ served in the Royal Newfoundland Regiment (RNR) and three of these died overseas. 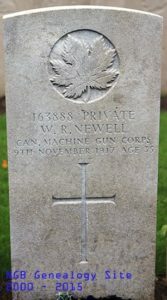 At least five other Newells from Burnt Head served in the Canadian Army and two of these were killed in action. At least two other Newells from Brigus / Georgetown served; one in the RNR and one in the Canadian Army; one of these died in France. 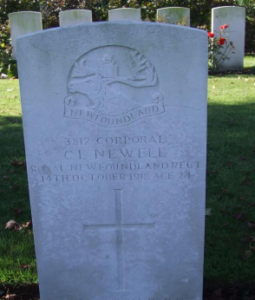 Corporal Clement Leslie Newell (Regimental Number 3812) is interred in Cement House Cemetery – Grave reference XVII. D. 14. 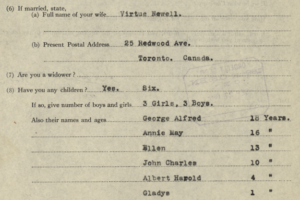 His occupation prior to military service recorded as that of a clerk, Clement Leslie Newell was an agent and traveller (travelling salesman – in his case, of insurance) and earning a variable monthly income of about sixty dollars working for the Scarborough Company of Canada. He was a recruit of the Fifteenth Draft. 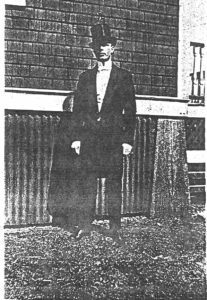 The youngest son of Nathaniel Newell, former fisherman, deceased August 30, 1912, and Margaret Jane Newell – to whom he had allotted a daily sixty cents from his pay – of The Dock, Port-de-Grave, he was also the brother of Elfreda*, Jabez and Harold. 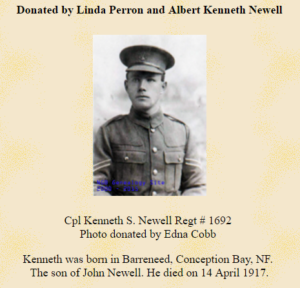 Corporal Newell was reported as having been killed in action, on October 14, 1918, while serving with ‘B’ Company in fighting beyond the Belgian village of Ledeghem during the Hundred Days Offensive. 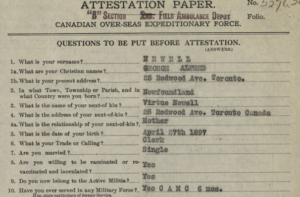 Clement Leslie Newell had enlisted at the age of twenty-three years and four months: date of birth, January 17, 1894, according to the 1911 Census. Born: The Dock, Bareneed, Conception Bay, NF. Private Victor Perrin Newell (Regimental Number 3598) is buried in Ayr Cemetery, Ayrshire – Grave reference G.2.6. 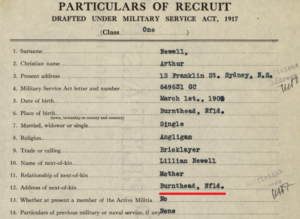 His occupation prior to military service recorded as that of a munitions worker earning a weekly $15.00, Victor Perrin Newell was a recruit of the Fourteenth Draft. 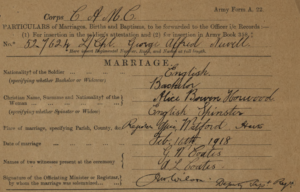 Having presented himself for medical examination at the Church Lads Brigade Armoury in St. John’s on April 14, 1917, he also enlisted – engaged for the duration of the war at the daily private soldier’s rate of $1.10 per diem – and attested on that same day. Private Newell was not to depart from Newfoundland for overseas service until May 19, when the Bowring Brothers’ vessel Florizel (right) left en route to Halifax. 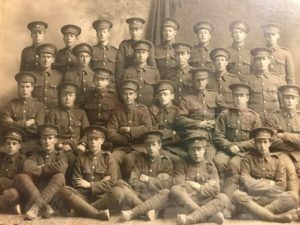 His contingent of three officers and one-hundred eighty-two other ranks, and also ninety-nine recruits of the newly-formed Newfoundland Forestry Unit, then left Nova Scotia for the United Kingdom on board an unspecified* vessel, on May 29. 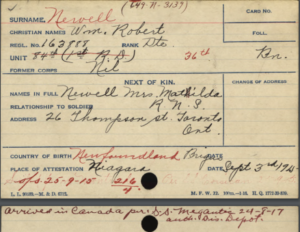 The son of Nathan Newell, carpenter, and Priscilla Newell – to whom he had allotted a daily sixty cents from his pay – of the Dock, Bareneed, Conception Bay, he was also older brother to both T.-Roy and to Mollie. 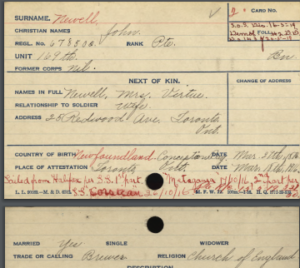 Private Newell was reported as having died of sickness in hospital on July 17, 1917. The cause was cited as septic meningitis following otorrhœa (middle ear infection) resulting from measles. The following 3 photos of Lewis Newell from photocopys provided to me by the late Jane Reed. 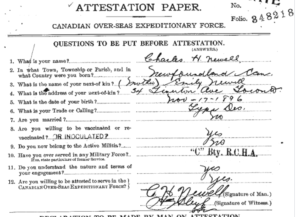 The following was provided by Maureen Hastings: My grandfather Louis Frederick Newell (his parents John & Susanna, grp Nathaniel and Virtue) enlisted as Richard Lewis Newell (because he was underage) on Sept 10,1915 age 15 but said he was 18. 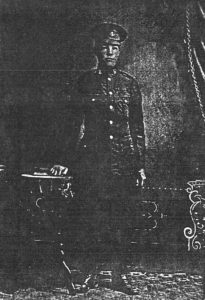 Re-enlisted Oct 1917, medically discharged Mar 2018. Harry Augustus was from Bay Roberts but his mother was Ruth Newell from ‘The Dock’ and his father was a Wells from Salmon Cove who was likely related to my great grandmother Caroline Wells. His parents were married at the Dock in 1890. WELLS Pte Harry Oct 25, 1918 24yrs,9mos No 3943. 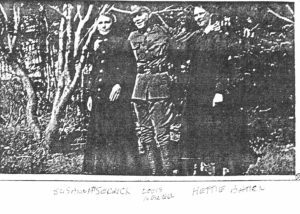 Son of Robert and Ruth Wells who was killed at Harleberke, Belgium. Died on the field of battle; ‘Twas noble thus to die, God smiles on valiant soldiers, His record is on high. The Following Newells from Burnt Head & Georgetown, Brigus also served. 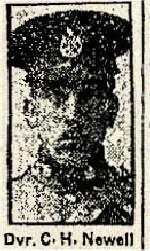 Served in Canadian Army, Died from wounds 10 Nov 1917. Following birth record indicates that he was from Burnt Head not Brigus; he likely gave the location of nearest large town on form. His wife Virtue. He sailed from Halifax in 1916. 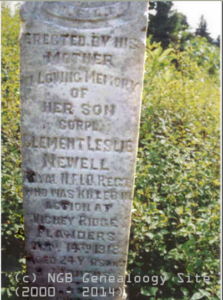 James Henry Newell was christened on 3 October 1897 in Brigus, Newfoundland, Canada. Parents: William Newell and Bertha . Canadian Field Artillery 2nd Div.